Not to be confused with Bomb Derby. 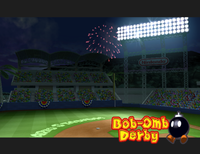 Bob-omb Derby is a minigame in Mario Superstar Baseball and Mario Super Sluggers. It is set in the Mario Stadium, and is played during nighttime. A roulette will start, and the player must press the A Button in order to stop it. It will land on a certain image, and a machine that looks like F.L.U.D.D. will shoot out a Bob-omb at the player. 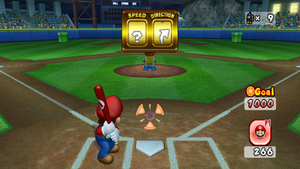 The player must then hit the Bob-omb, in order to score a Home-Run. A Home-Run is always succeeded, but sometimes it will become a Foul Ball for going past the boundary line. Mushroom: The Bob-omb will be slow, and will be easy to hit. Fire Flower: The Bob-omb will travel at the normal speed rate of the normal Baseball. Star: The Bob-omb will be somewhat fast. Fireball: The Bob-omb will zoom pass the batter very fast, making it harder to hit. Question Mark: One of the previous Bob-omb speeds except for King Bob-omb will be fired. The player can score more points if they keep hitting the Bob-ombs, without missing one. This is called a Combo. However, a combo can easily be thrown off if a Bob-omb is missed. In Mario Super Sluggers, it is the same. Also, the F.L.U.D.D.-like cannon is replaced by a normal one. In multiplayer and Grand Prix mode, several players participate hitting balls to the sky. The game play is the same except players stop the roulette and there is a third roulette marked with the characters' heads on them. If the third roulette lands on the character's head, the character is given a chance to destroy the firework by throwing baseballs at the flying Bob-omb. If the character succeeds, points are awarded to that character while the batting player receives no points. The roulette can also make either all opponents throw baseballs at the flying Bob-omb or none, if it lands on the X. This page was last edited on November 3, 2018, at 20:54.